I am always on the look out for vegan snacks. I will pick up anything and give it a try if it is vegan! 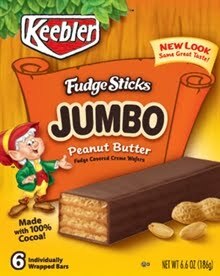 Right now these Keebler peanut butter sticks are a hit around here. Not the healthiest thing - but one at night with a cup of tea or decaf hits the spot! Matt was like "wow - who makes these?" and studied the box for future purchases! They have that comforting quality of the lunch box snacks you grew up with. 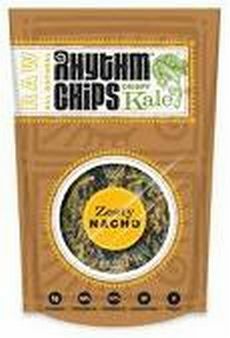 On to something a bit more healthy - but seriously addicting, Rhythm's zesty nacho flavored kale chips. Not really a traditional crispy chip - more like soft chip crumbs - these are odd but you have to have more. There is a mild kick to it but it has a cheezey like taste. I would like to try other flavors but this was all I could find at the store down the street! Have you discovered any new snacks that you can't get enough of lately? There hasn't been much I've been eating a lot of lately, but I have been eyeing up those kale chips for a long time now. They look good!